5-in-1 Brody Convertible is another great baby bed from Dream on Me Inc. In this article, we’ll discuss some of the features and benefits of purchasing a 5-in1 Convertible Crib. But before that- let’s understand the basic qualities of this product and how it can help to provide a peaceful place to sleep. As it allows you to convert the crib into a toddler bed, day bed, full size bed you can achieve a lot from this unit. So you can buy it from any one of company. Multi-functional: When it comes to convertible crib multi functionality is the first thing that comes into the mind of every buyer. You will need to purchase a toddler guardrail which allows you to easily transform the crib into a day bed. Please note that- if you want to buy a mattress and changing table along with it- you will have to pay extra money for the same. Safety: Never buy baby furniture, especially, a crib- if it’s not certified from JPMA and ASTM organization. Dream on Me has been in this business for a long period of time and one of the best crib brands and they deeply understand the value, safety of their products. They make sure all the products are being manufactured in the organization meets the standard requirements of the government. Size & Height: The product has a dimension of: 69Lx33Wx39H. This is huge enough for your little one to rest. The good thing is: when required you can adjust the height of the mattress within the crib. Long Lasting: Every parent wants to purchase an infant bed that stays for a long duration. It has two advantages: first, you will not need to make another purchase for the extra bed when baby grows; second, you will not have to go through lots of work like finding out the space to fit the bed. In nutshell, it is a win-win situation for the parent and kid. Storage: 5-in-1 Brody crib allows you to attach a changing table that has 3 set of drawers. Though, you will need to pay for the extra furniture table as it doesn’t come with the crib. 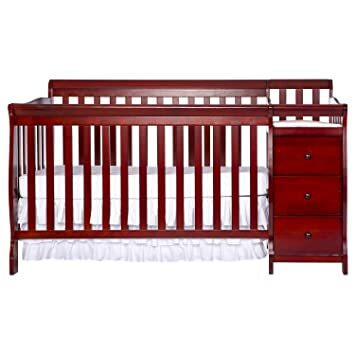 This is the best inexpensive convertible crib available within this price range. Usually, convertible cribs are pretty expensive but that’s not the case with Dream On Me 5-in-1. There is an extra storage space for which you will have to pay but that is great investment because you can keep a lot of stuff in that table which is attached to the crib. The unit require huge space in room where you will keep in, though, this is not a disadvantage but for those who have small rooms in their home- it’s a challenge. It takes time to assemble the whole product and putting together all the stuff to make it workable. Dream on Me 5 in 1 Brody is designed with high quality woods. Everything from furniture to screws bolts and nuts are manufactured with safety keep in mind. If you’re looking for a bed for your newborn’s and you need everything from versatility to safety and protection this is a best investment you can make.